Tiredness, jet-lag, a low immune system? Our Vitamin Booster Shots take just a few seconds to administer and provide a feeling of wellness that lasts for days. Tiredness, jet-lag, a low immune system? Many of our clients often turn to energy drinks or coffee throughout the day to give them a pick me up, however this is generally a quick fix that typically only lasts a few hours. Our Vitamin Booster Shots take just a few seconds to administer and provide a feeling of wellness that lasts for days. The street and strain of modern-day lifestyle means we are all vulnerable to developing a vitamin D deficiency and if you constantly feel tired and rundown then you may be in need of our Vitamin D Shot. Nicknamed the ‘Sunshine Vitamin’, vitamin D is essential for all-over health and wellness. Call us today and book your Vitamin D Booster appointment. Our Vitamin Booster Shots offer 100% absorption into the body and aim to leave your energy levels feeling revitalised and restored. Clients usually begin to feel the full effect of the Booster Shot two hours post treatment with the effects lasting for days. Who are Vitamin Booster Shots for ? Vitamin Booster Shots can treat a wide range conditions and can be tailored to suit your needs with the procedure aiming to replenish and revitalise. The treatment is not used as a method of therapy for medical conditions but generally used as a lifestyle and well-being treatment. Whether it be a busy lifestyle, over exertion, a hectic work schedule or just general tiredness. The treatment is ideal for those wishing to restore vitamin levels, improve their energy and ultimately feel their best. What is in the Vitamin Booster Shot? The Vitamin Booster Shot contains 0.9% sodium chloride (saline solution) or a 5% dextrose solution, an isotonic carbohydrate (sugar solution) that contains glucose in sterile water depending on the ingredients being used and the desired effect e.g hydration. 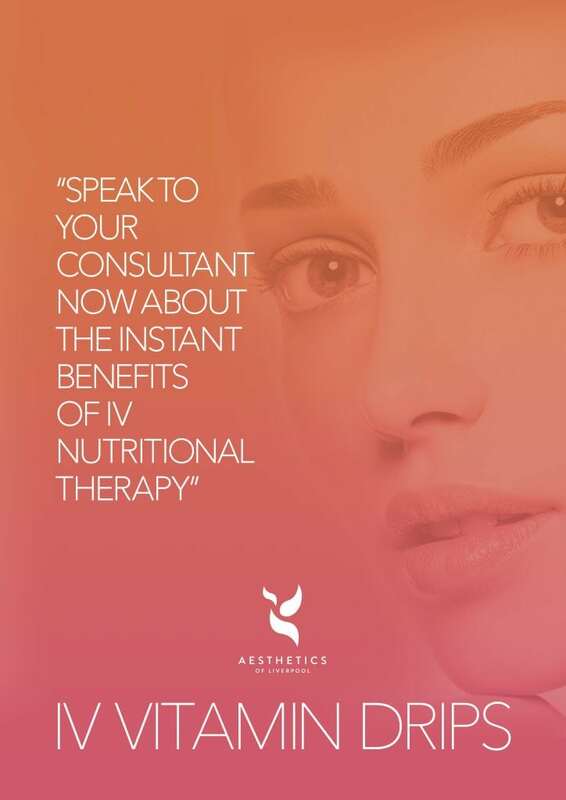 Prior to treatment you will have a consultation with an Aesthetics of Liverpool practitioner, during this consultation you will be able to discuss any concerns, what you are hoping to achieve and decide what formulation will be most beneficial for you. During the actual treatment your Aesthetics of Liverpool Practitioner will administer the Vitamin Booster Shot into your arm, this takes just a few seconds. Where you have been injected will then be covered with a small plaster. You will then be free to leave the clinic,some clients feel results immediately, though it can take up to two hours to feel the full effect. Following treatment there is no down time and clients are able to return to to their day to day activities. Clients are simply required to wear a plaster over where the IV had been inserted similar to after a Blood Test with your GP this usually take 24 – 48 hours to heal. Who is the Vitamin Intravenous (IV) Therapy not suitable for? Prior to treatment you will have an initial consultation it is here will be able to discuss contraindications and establish your suitability for treatment. What does the Vitamin D Booster cost?